This year’s Design for government course began in an invigorated manner, focusing on the national ‘Hiking Areas’ across Finland. We were tasked by the Ministry of Forestry and Agriculture to come up with new uses, potential new users and identity for the state’s hiking areas. We examined Evo as a case study. Evo is the only Hiking Area within easy reach to a large part of the population of the country; this fact intrigued us right from the start, considering the large stake it could have. 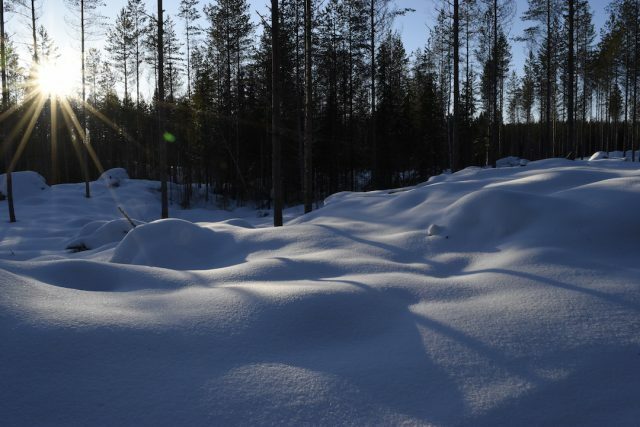 How can we enhance Evo and provide it with a whole new dynamic identity so that it creates a better experience for visitors, local businesses and the state’s forest management company, Metsähallitus? Evo Hiking Area in the winter. Photo: Hsiao-Pei Liao. The course sought to provide us with certain tools and direction to answer the prior question. It was conducted over a period of three phases. During the first phase, we journeyed through the ‘Human Perspective’, wherein we viewed the current situation in Hiking Areas with fresh eyes. This phase also involved a trip to Evo, observing what a typical visitor may go through. After trekking in the snow, tip-toeing on frozen lakes, and enjoying a night at the sauna, we obtained a strong human-centered perspective. The second phase took us through the ‘Systems Perspective’. Here, we analyzed the existing scenario as a system containing broadly defined inter-connected actor networks. This phase provided us with a broad overview of what it is at stake and how specific interventions would affect other entities in the system. The idea was to imagine and assess these entities as a whole and not be carried away by a narrow outlook. The final phase, called the ‘Intervention Perspective’ aimed at bringing in our own designs and interventions into play. These calculate interventions would eventually transform the existing status quo in the hiking areas. What would our interventions look like? Our team enjoyed a field trip in Evo Hiking Area. Photo: Hsiao-Pei Liao. Our diverse team consisted of different members from varying nationalities, backgrounds, and ideologies. What bound us together was our keen passion on outdoor as well as nature related activities whether it was through our own prior experiences with trekking, camping, biking, swimming or through extensive research dealing with it. We had frequent sessions wherein we spent a part of the day after lunch ideating outdoors. One fine day during ‘spring’, we sat on the rooftop of our main building and came up with the idea of Evo being a space where events would be held frequently. This was not just any idea popping out of the blue, but would be something feasible and practical requiring specific minimal interventions. It would also bring in so much of energy, dynamism, and liveliness, eventually providing a new identity to Hiking Areas across Finland. Our team stood in agreement and were enthusiastic about the overall concept; we decided to proceed further. In order to turn Evo into an ‘Eventful forest’, we probed into other parts of the world where similar ideas might already be put to practice. We benchmarked various popular events, ranging from quiet and peaceful ones to those that are outlandish and driven by adrenaline rush. For example, mountain bike races are quite popular in Australia, while the ‘Spartan Race’ is a hit across US and Europe. Forestry trade fairs occur frequently in Germany. Luge and cross-country skiing are popular during the winter in Estonia, Canada, Sweden and Finland. 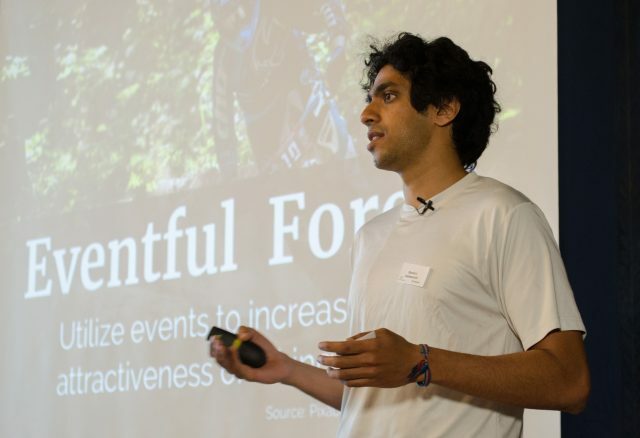 During the past couple of decades, events for nature-related outdoor activities are trending around the world. One of the compasses we created to rate how suitable existing events are for Evo. 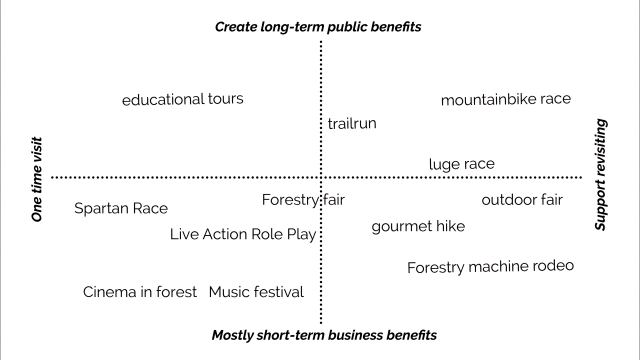 This helped us assess Hiking Areas as spaces, understanding the range of possibilities they could accommodate. At present, the communication between Event Producers and Metsähallitus is not very sound. Despite the infrastructure in Evo being updated regularly, it is merely maintained and doesn’t provide an ecosystem for events to take place. Hence Event Producers find it too expensive, futile and unattractive to host events in Evo. 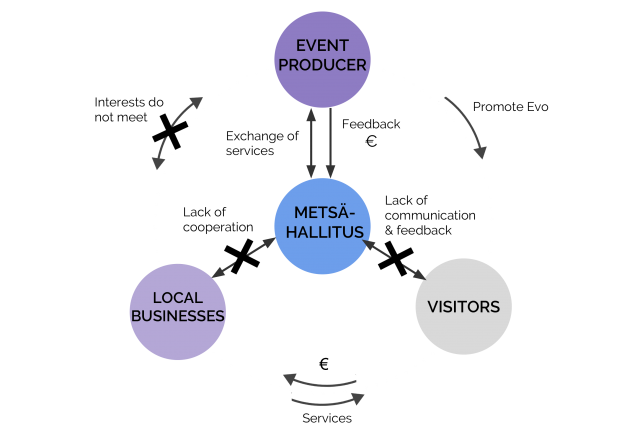 Due to events not being held and stagnant visitor number, Metsähallitus is not prepared to enhance the infrastructure and overall ecosystem for events. This creates a negative feedback loop. Our initial idea was to create a platform that directly connects Event Producers with Metsähallitus. 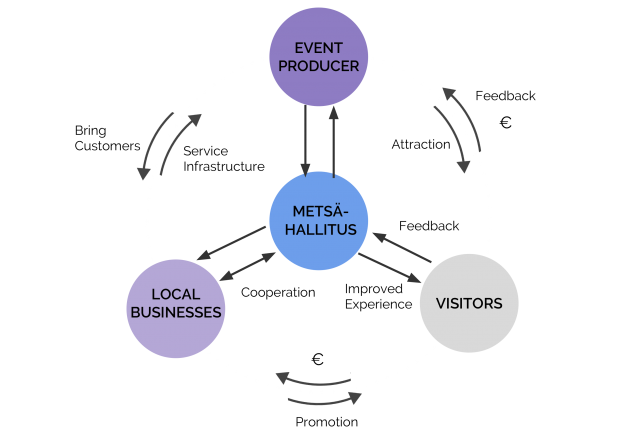 Using the platform, the Event Producers could approach Metsähallitus with their production ideas and estimates. Metsähallitus then decides whether to approve, suggest changes or reject the proposal. Throughout the cycle of the event, Metsähallitus would act as a facilitator, making their role smoother. At the same time, it would be easier for the Event Producers to obtain permit, conduct events and receive support from Metsähallitus. This creates a win-win scenario for both of them. We approached certain key figures in the Ministry and Metsähallitus seeking their inputs, suggestions, and validation to our proposal. Generally, they had positive feedback about our event facilitation model and believed it would benefit major stakeholders in the region. One streamlined process for event application and organization is great. Events would be really beneficial for the area development. The best case would be that there are 2-4 major annual events serving as anchors and smaller more topic-specific events supporting the event cycle. Larger events would generate smaller ones. Consolidating both operators in Evo Hiking Area into one entity and event producers into one larger operator responsible for event management would make the picture as a whole easier to manage. Metsähallitus would be interested in hiring an external organization to manage the events. It is easier to organize large events in hiking areas than private forests. It is easier to develop something in hiking areas and put public fund. More visitors will bring more money and livelihood for the local economy. That’s why we need the Hiking Areas to be more active and more alive in order to boost the local economy. The current simplified system and its flaws highlighted according to our analysis. The future system, if our proposal is used to develop Evo. A figure representing the process of event production within our model. All nerves were kicking in as we prepared for our final presentation. A key aspect of the whole course was coherently communicating our intervention proposal to various stakeholders and interested party. Grueling sleepless nights, bottomless coffee cups, and last-minute changes carried us through. Gautam Vishwanath presenting our proposal. Photo: Heidi Konttinen. 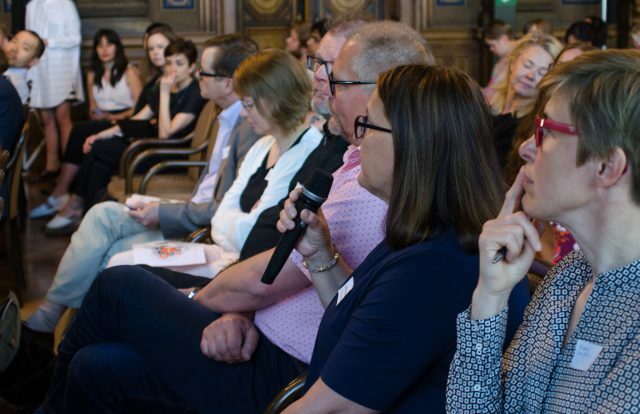 Eventually, we presented our entire proposal at the ‘House of the Estates’ to various key figures from different ministries, Metsähallitus, Design for Government alumni and teachers. A main valid critique was our lack of focus on ecological value of Hiking Areas, especially during a time in which forests are being depleted at an accelerating rate. However, we countered this notion because the model improves facilitation, communication, and Hiking Areas would attract events only when it has a strong ecological value. So, these entities are dependent on each other. Commissioners asking questions after the presentation. Photo: Heidi Konttinen. It was an overwhelming course, a great deal of learning and unlearning. We experienced the messy inner workings within ministerial bodies, Hiking Areas in temperatures way below the freezing point, volatile teamwork and a broad theoretical framework. Four years down the line, we might get together once again, hopefully meeting in an enhanced eventful Evo! The DfG course runs for 14 weeks each spring – the 2018 course has now started and runs Feb 20 to May 22. 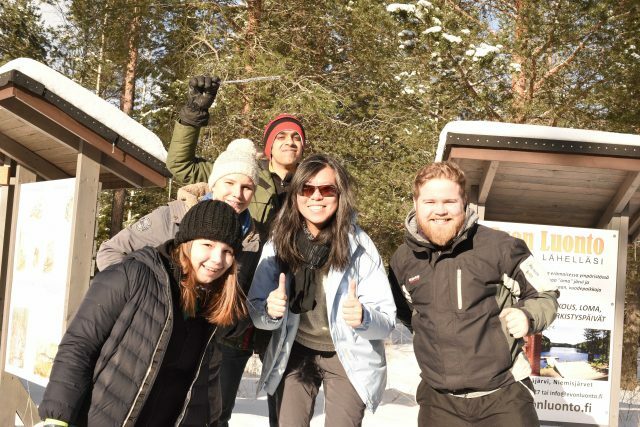 It’s an advanced studio course in which students work in multidisciplinary teams to address project briefs commissioned by governmental ministries in Finland. 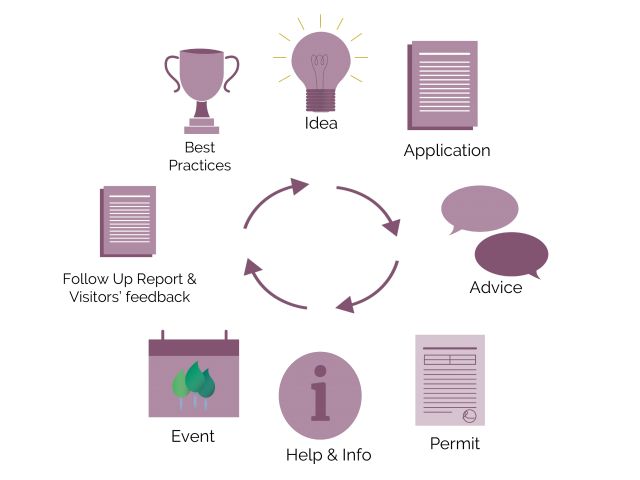 The course proceeds through the spring as a series of teaching blocks – Human Perspective, Systems Perspective and Intervention Perspective – in which various research and design methods are applied to addressing the project briefs. Blog posts are written by student groups, in which they share news, experiences and insights from within the course activities and their project development. More information here about the DfG 2018 project briefs. Hold the date for the public finale 09:00-12:00 on Tuesday, May 22!